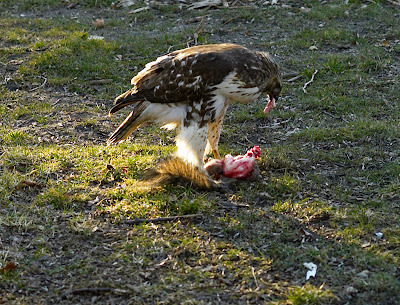 Today on the grass in Tompkins Square Park a juvenile Red Tailed hawk had a late in the afternoon lunch of squirrel . 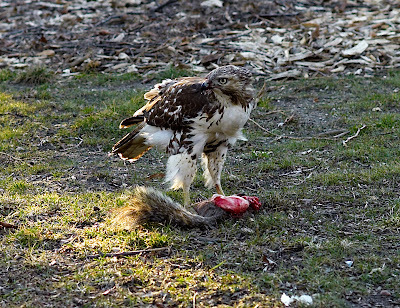 Picking in a finical manner at the bushy-tailed entre the predator ate just the parts that tasted best and then , red in beak and talon , left the ravaged , still warm corpse on the lawn flying off to a near-by tree and then later on around the park . 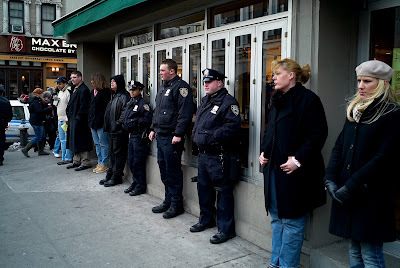 Well , there had not been any shots fired but a call from avenue A had been made claiming that there had been shots fired and the call had also been mysteriously cut off so NYPD had to respond .Several cars shortly arrived at the site where the shots had reportedly been fired which was the Pyramid Club on ave A . 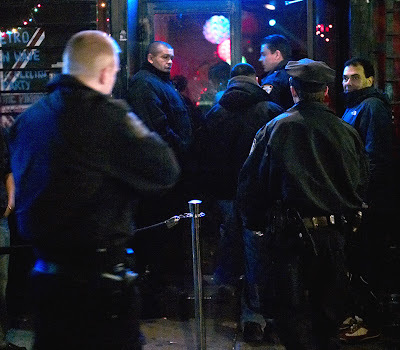 It was Goth night and there were certainly no shots fired but still NYPD had to enter the club and verify that all was in proper order . This is one aspect of life in the city that most probably don't think about but both FDNY and NYPD answer many ,many false alarms . When a call comes over the air it is as genuine as any other call :in the beginning there is no difference ,all calls are the same .Every one does their job as though each call is genuine . No one ever knows for sure what awaits . 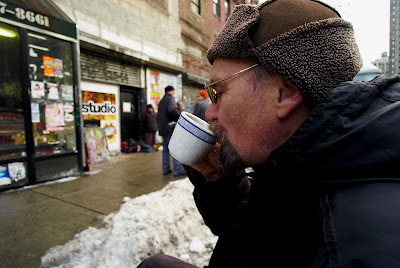 The Reverend Billy leading his followers across the street from the Astor Place Starbucks. 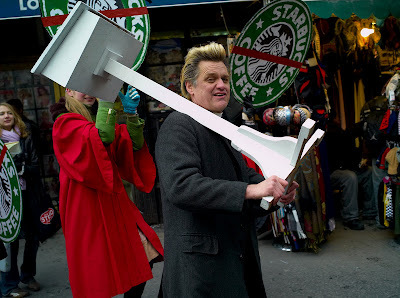 The Reverend Billy preaching at the Cooper Union Starbucks. 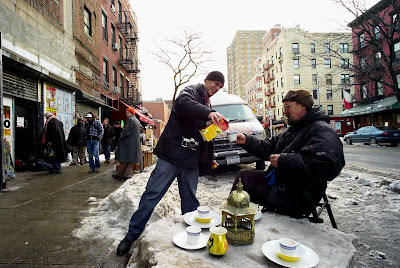 The Reverend Billy on the march on St. Marks Place on the way to 9th street and 2nd Avenue Starbucks . No love lost here ....right? 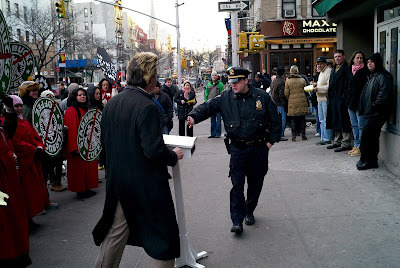 Sergeant Brown instructs the Reverend Billy to move his lecturn to the side of the sidewalk and clear the sidewalk for pedestrian traffic at the 9th street and 2nd avenue Starbucks . That Starbucks line is impressive with lots of beef up front : very intimidating . 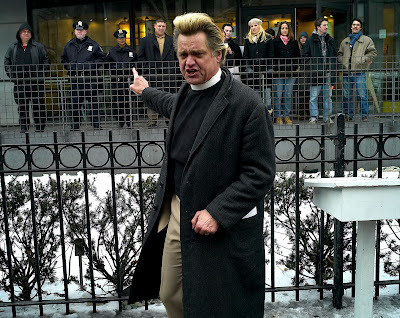 This week the Reverend Billy was not arrested . 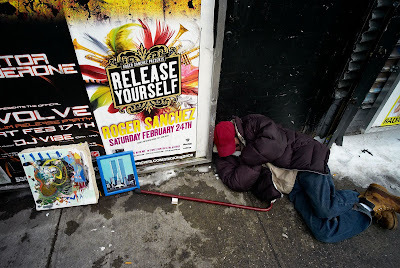 I suspect that he has had enough of the accomodations downtown and is not at all interested in ever being arrested again : no one in their right mind with knowledge would want to be ...right ? 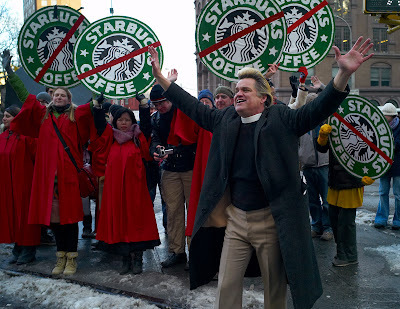 I have been told that the Reverend Billy will continue his Sunday afternoon protests at Starbucks on into March sometime . 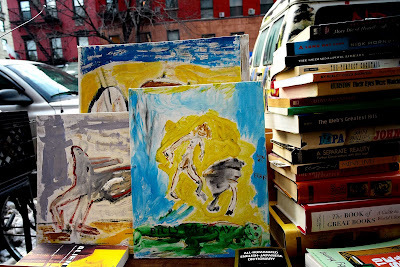 It's Saturday afternoon and Joe has set up his tables of books and paintings on avenue A . Joe comes to this location often to install a sculpture or a conceptual piece but today there is also some intent to not just install but to sell something and make some money. 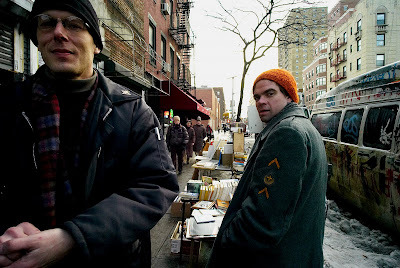 As one can see the location is not Joe's alone : several others with other purposes are also on avenue A . 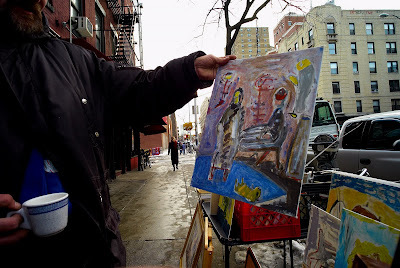 Today Joe is trying to sell some paintings that he purchased from a dealer in Brooklyn which were painted by a painter by the name of Korsak who , according to Joe , 5 years ago mysteriously dissappeared from Greenpoint without a trace . 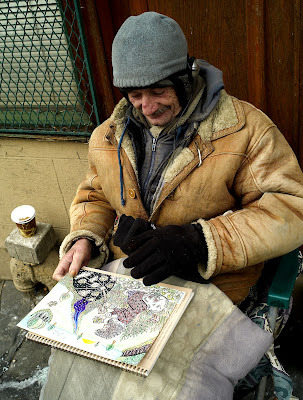 Strange ,sparse ,scribbled ,scratched , thinly painted and sometimes with merit these paintings are not for everyone . 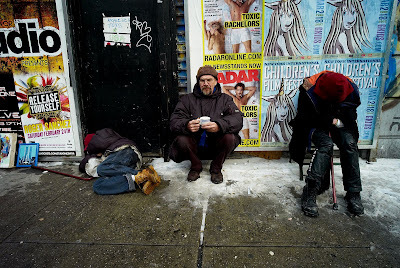 Some of Joe's fellows , before this day is done , pass-out and take a trip to detox at a local hospital but not Joe . 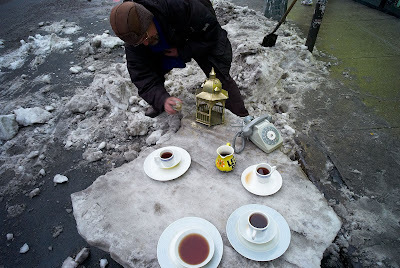 He has set up his own tea service (iced with lemonade ) at curbside with a gazebo that he later in the afternoon gilds. 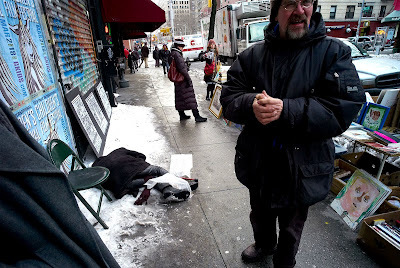 Eddie ,who lives on my block , was recently caused to hole -up in a neighborhood basement for three days by the cold and snow . While inside for these three days , apart from the world outside , he was beset by dreams of God and his creation of the universe . 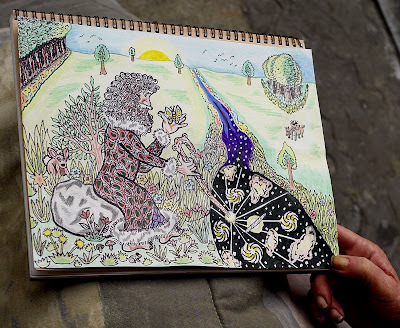 Possesed of his dreams he drew his cosmogony .